Videos of violence in a Skyline High School classroom has raised concerns over fights and disturbances on the campus. DALLAS — Concerns over violence at a Dallas high school were highlighted in videos that surfaced Friday of a physical altercation involving a student and teacher. It's unclear what led up to altercation but sources who work at Skyline High School said it began Thursday when the student allegedly refused to sit down when a substitute teacher asked him to do so. 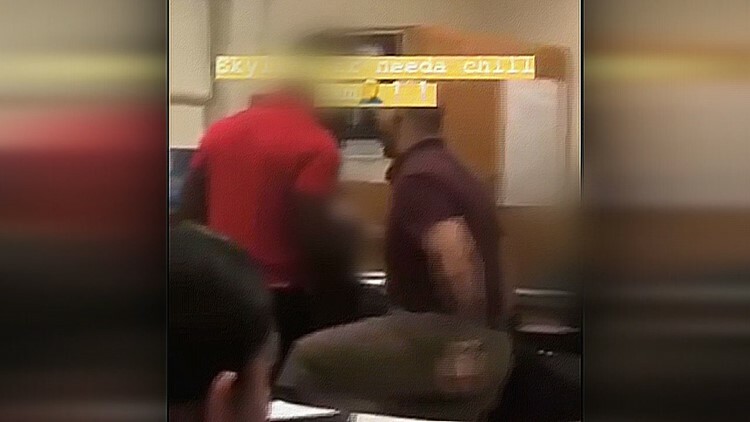 The first video that captured the altercation starts with the substitute teacher standing body to body with the student, who puts his right arm out to keep the teacher at a distance. The teacher then lifts his left leg toward the student, who uses both arms to push him away. The video cuts off but a second clip shows the violence escalating with the student punching the teacher, who's fallen to the floor. The end of the video shows students helping break up the fight and assisting the teacher. Representatives from a teachers union who watched the videos said they question what training the Dallas Independent School District has in place for staff and substitutes. Honea also added that this video is the kind of thing that keeps future educators from choosing the district. "It's incredibly disappointing and it has taken away from the profession. Fewer and fewer teachers want to go in our classrooms because of things like that, and we need them desperately." Teachers say there were two additional fights at the school earlier in the day. They also say disturbances are becoming too common and want administrators to do more to address the tensions and disruptions. Sandra Verduzco, a spokeswoman with Dallas ISD, said the student has been disciplined "according to district’s policy" and the administration is further investigating the incident. Verduzco also told WFAA that the district is moving quickly to fill vacant monitor vacancies at Skyline so more eyes can be on DISD's largest school. A YouTube search pulls up numerous videos of fights that have allegedly taken place on the Skyline High campus. Ola Allen, a Skyline grandparent and former PTA President for the school, says the district isn't doing enough. "It's very disgusting, and to think that's a learning institution and that's what we're seeing there," Allen said. "It's not getting better, it's getting worse." "The district's responsibility is to make sure that when your child leaves home, they're in a safe environment. That's not happening." A summer crime initiative was launched this year in the area of the school due to high violence in the neighborhood. In June, a woman armed with a gun approached people walking on the school's track during the early morning hours and fired a shot that injured a former Dallas ISD employee.